This soup is the concentration of fall flavors and spices. The creamy pumpkin, the spiced seeds—sweet and savory. 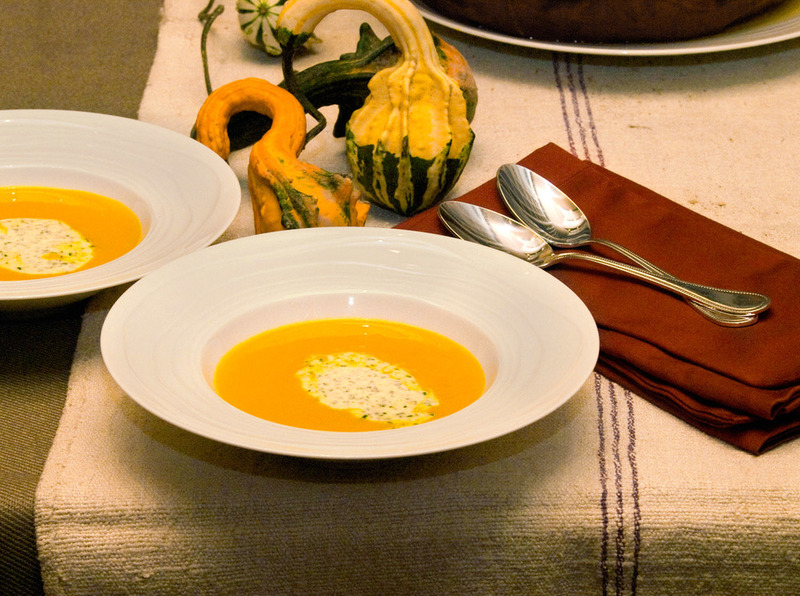 Serving the soup in a pumpkin is an easy way to complete the dish and impress guests. Preheat oven to 400°F. Melt the butter in a large pot over medium heat. Add the onions and garlic; sweat until translucent, about 3 minutes. Add the diced squash and sauté until softened, about 10 minutes. Cover squash with the chicken stock and bring to a simmer. Cook until tender, about 30 minutes. While the soup is cooking, prepare the large pumpkin to serve the soup from. Remove the top of the pumping with a sharp knife in a zig-zag pattern. Scrape the seeds out and season the inside of the pumpkin with salt and pepper, add the butter and roast in the oven until tender and lightly caramelized, about 30 minutes. Purée the soup in batches, in a blender until satiny smooth. Pass through a fine chinois to remove any remaining lumps. Return the soup to the pot and add the cream and bring the soup to a simmer. Wrap the thyme sprigs, peppercorns and bay leaf in cheesecloth and close with kitchen string and add to the simmering soup. Infuse for 10 minutes. Remove the thyme bundle and season to taste with salt and pepper. Serve the soup in the roasted pumpkin. Garnish with spiced pumpkin seeds and herbed crème fraiche. Melt the butter in a sauté pan, add pumpkin seeds, cayenne, cumin and coriander. Toast the pumpkin seeds over medium heat until golden brown, stirring frequently.